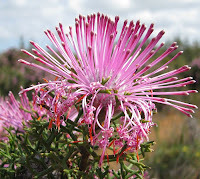 The botanical name of Isopogon formosus, refers to this plants beauty that I fully concur. The 5 cm (2") diameter terminal flowers are a rich magenta and perched on top of neatly symmetrical and compact divided foliage, thereby presenting a most pleasing spectacle. 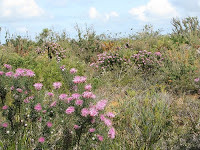 Fortunately the foliage is prickly, so not suitable for the cut-flower trade, otherwise its numbers in the bush might have been compromised by now. 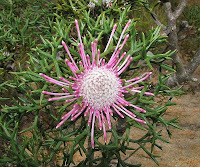 There are two subspecies, but the other one, 'subsp. 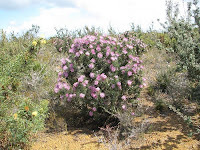 dasylepis' is rare and only found in the far southwest corner of WA, so well outside the Esperance region. The local subsp. 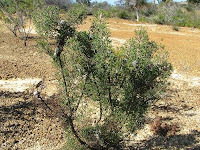 formosus, is recorded growing to 2 metres (over 6') in height, but most plants in this area are closer to 1 metre (around 3') and can be found in low-lying sandy areas, particularly when over-lying heavier soils; on flood plains; on granite outcrops where there are pockets of laterite or eroded broken rock, plus on sandy rises where seepage drains from one ephemeral swamp to another. Not sure of the pollinator for these plants, but with the long narrow floral tube, something with a long proboscis, maybe one of the larger moths. 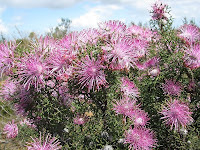 Recorded flowering from July to December, but in the Esperance region, August to October would be the main period, although variation in seasonal rainfall could extend this either way.